“Target’s investment in Canada’s economy shows our plan is working and will be of great benefit to Canadian workers, Canadian consumers and their families,” said the government's media release announcing its approval of the Target takeover. Tell that to the Zellers workers, whose benefits and family security are about to be trashed by a company which refuses to guarantee rehiring them; and even if they are, only at the starting rate and without seniority. As for the "plan" so proudly announced in the government's media release, it is the Harper plan that the best way to attract employers is to help them strip workers of their wages, benefits and collective agreements. 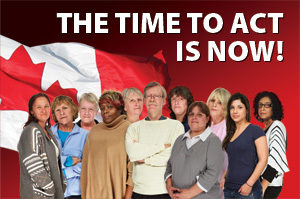 Target and its government allies can attempt to discount the rights of Zellers workers, but Canadians aren't buying it. Since its launch five months ago, www.targetfairness.ca — a national awareness campaign by Zellers workers supported by UFCW Canada — has met with overwhelming support from Canadians coast-to-coast. In Quebec, a petition has now been filed with the Minister of Labour to compel Target to live up to the Labour Code and recognize the successor rights of Zellers workers. Legal actions are also ongoing in British Columbia, and rallies and billboards across the country continue to drive the message home that the fight for the future of Zellers workers is proceeding on all fronts. Together, we can make Target do better by keeping the pressure on. Every letter sent to Target is read and noted. Add yours by going to www.targetfairness.ca. When you shop at Zellers, let the workers know you support their fight for justice. Add your message of support at www.facebook.com/targetfairness. Let Target know that fairness is the bottom line if it wants to succeed in Canada.